On the 10th (Mon), admire nature's wide array of creatures at Ripley's Aquarium of the Smokies. Plan my trip to Gatlinburg with suggested itineraries provided by Inspirock. Houston to Gatlinburg is an approximately 5-hour combination of flight and taxi. You can also do a combination of flight and car; or drive. You'll lose 1 hour traveling from Houston to Gatlinburg due to the time zone difference. Prepare for slightly colder weather when traveling from Houston in June: high temperatures in Gatlinburg hover around 86°F and lows are around 66°F. Finish up your sightseeing early on the 11th (Tue) so you can travel to Savannah. Kick off your visit on the 12th (Wed): take a tour by water with Boat Tours & Water Sports, then wander the streets of Savannah Historic District, then explore the different monuments and memorials at Bonaventure Cemetery, and finally contemplate in the serene atmosphere at Cathedral of St. John the Baptist. Get ready for a full day of sightseeing on the next day: identify plant and animal life at Wildlife Areas and then stroll through Coligny Beach. To see photos, more things to do, traveler tips, and more tourist information, go to the Savannah day trip website . You can do a combination of taxi and flight from Gatlinburg to Savannah in 6 hours. Other options are to do a combination of taxi and flight; or drive. Traveling from Gatlinburg in June, plan for a bit warmer nights in Savannah, with lows around 72°F. Finish up your sightseeing early on the 13th (Thu) so you can travel to Marathon. 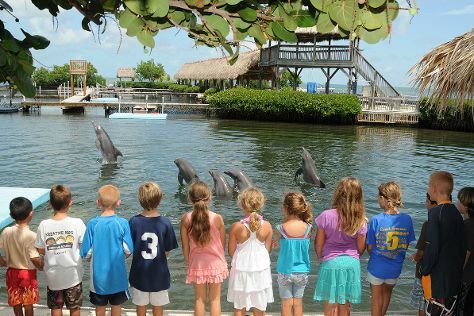 On the 14th (Fri), look for all kinds of wild species at Dolphin Research Center, then tour the pleasant surroundings at Sombrero Beach, and then look for all kinds of wild species at The Turtle Hospital. To find traveler tips, where to stay, photos, and tourist information, go to the Marathon trip itinerary planner. Do a combination of flight and shuttle from Savannah to Marathon in 6.5 hours. Alternatively, you can do a combination of flight and bus; or drive. Traveling from Savannah in June, expect somewhat warmer with lows of 79°F in Marathon. Cap off your sightseeing on the 14th (Fri) early enough to catcht the bus to Key West. Start off your visit on the 15th (Sat): admire the majestic nature at Fort Zachary Taylor, then take an in-depth tour of Truman Little White House, and then identify plant and animal life at Key West Butterfly & Nature Conservatory. To find traveler tips, other places to visit, photos, and other tourist information, read Key West trip itinerary builder site . You can take a bus from Marathon to Key West in 1.5 hours. Another option is to drive. In June in Key West, expect temperatures between 88°F during the day and 79°F at night. Finish your sightseeing early on the 15th (Sat) so you can travel back home.